Dietary supplement. Ease travel sickness. sweet and tasty natural apple flavor. PACKAGING: 3 apple flavored lollipops. Travel lollipops contain ginger and peppermint extracts. Ginger prevents feelings of sickness and vomiting associated with the use of vehicles. Peppermint helps with flatulence and belly spasms and contributes to relaxation. To get the best possible effect, we suggest licking the lollipop half an hour before traveling. 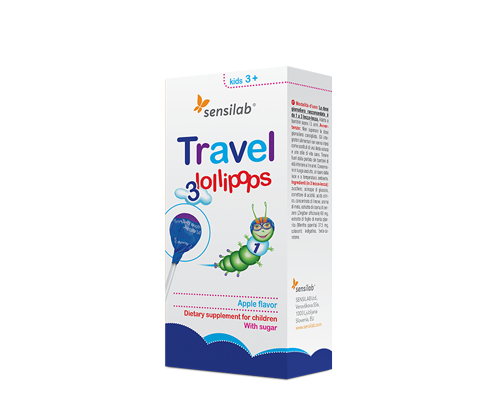 Travel lollipops are innovative form of dietary supplement that children will love. Suitable for children from age 3 and above. Use: Recommended daily intake: 1-3 lollipops. Active ingredients in 1 lollipop: ginger rhizome dry extract 20 mg, peppermint leaf dry extract 12.5 mg.